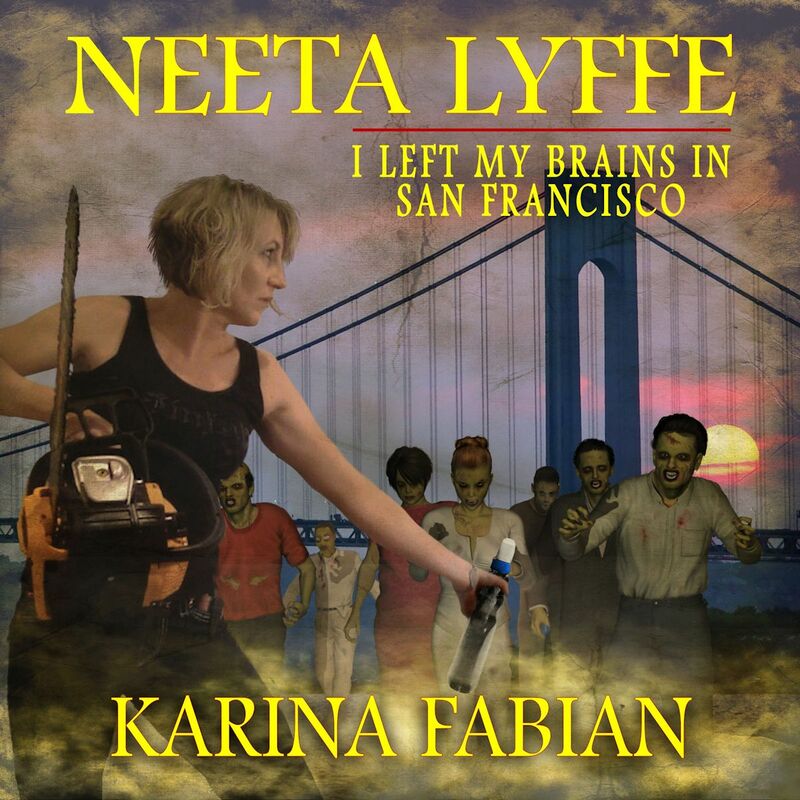 Okay, we finally have the Audible link for Karina Fabian’s book, I Left My Brains in San Francisco. This is the second book in the Neeta Lyffe series. 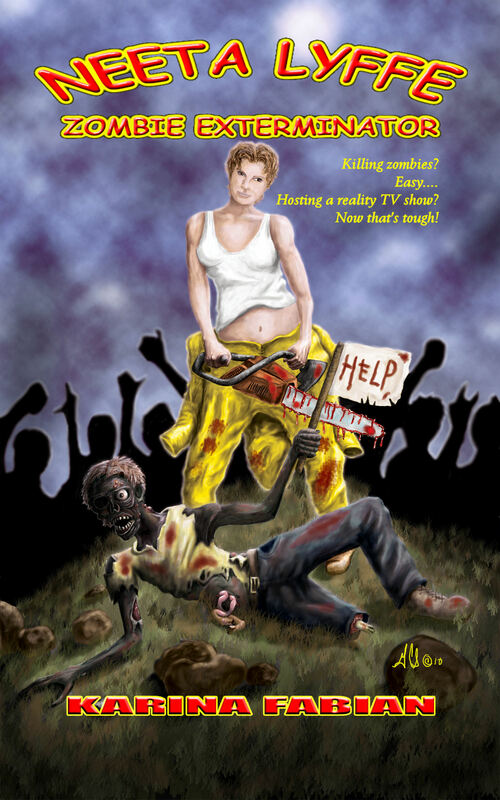 If you like your zombies on the funny side, you need to read/listen to these books. I’m on vacation this week and giving myself a birthday present. 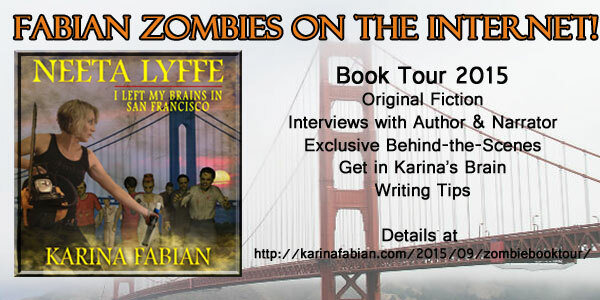 I’m interviewing my friend and fellow writer Karina Fabian. She has a new audio book that should be dropping this week. Zombies are dead people whose hind brains haven’t clued into the fact yet. While they sometimes keep enough brain function to do things like return home, shamble through a drive-thru or try to vote, they aren’t really making conscious decisions. So, if one dies while on vacation and was really, really invested in doing something while on that vacation, its soulless corpse may return to hang out on the beach or go skydiving – likely what may have killed it in the first place, but zombies don’t really learn from their mistakes, either. However, it would not take a vacation. What’s been you experience with audio books? Do you like it or not? Will you do it again? I’ve had a great experience working with Becky Parker on the audiobooks. She has a good narrative style, fun voices and has fantastic special effects. It puts a new spin on the story. I’d love to do it again. In fact, I suggested to my publisher we just jump right to producing Shambling in a Winter Wonderland in audio, too, and have the print and audio come out together. Do you have a bazillion notes on Neeta like J.K. Rowling has on Harry? Nope. Neeta tells me what I need to know as I write the story. How has writing Neeta Lyffe impacted your other writing universes? My universes stay separate. I don’t see them crossing over, ever. They each have their own histories and population, and I enjoy moving from one to the other. Each book I write does teach me lessons I can apply to other novels, however. I’d say Neeta’s books help me remember to keep in mind how the wider world affects the doings of my characters. I know you’re teaching a world building class. How did you build Neeta’s universe? Actually, the worldbuilding class was in August. This month, I’m teaching monster creation. You can learn more and register at https://www.anymeeting.com/AccountManager/RegEv.aspx?PIID=EB59D786854E39. Neeta’s universe was the easiest one to build, since it’s ours 30 years in the future. I took current social and political trends, projected them to ridiculous extremes (or what I hope would be ridiculous), and then added the zombies. I took a different approach to zombies. I have a hard time believing in the overwhelming apocalypse model, especially as we were in the middle of the H1N1 scare at the time I started the series, and while some people were sure we’d wipe out a significant amount of the population, strong controls made it a tempest in a teapot. I figured the same thing would happen with zombieism. Even if we didn’t figure out what caused it or how to cure it, we would put controls in place to contain it. Thus, zombies as pests, not pestilence. If you could ask Neeta a question, what would you ask her? Why was it so hard for you and Ted to just admit you loved each other? It was the hardest part of the book to write. I always enjoy having Karina on the blog. You can find her and all of her universes at Fabian Space.